The PartnerTech RP-500 has been discontinued. No direct replacement is available. The birth child of years of field testing, research and development, the RP-500 is a high speed PartnerTech printing mechanism thermal receipt printer. 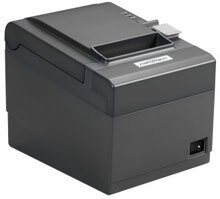 The RP-500 has a printing speed of up to 200 mm/sec with 58 mm or 80 mm paper width. Easy installation, operation and maintenance are what sets the RP-500 apart from other printers. The printer runs on a very low standby power consumption of 1 watt. Various interfaces (serial, parallel, Ethernet or USB) guarantee a quick and easy installation and simple integration into a variety of POS environments.